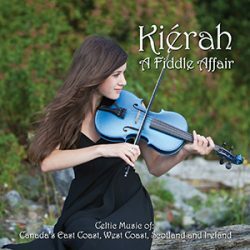 “A Fiddle Affair” is named for Kiérah’s love of the instrument and all the wonderful music played with it. This fiddling virtuoso has taken East Coast, Scottish and Irish tunes, blended them with her own original tunes and created this wonderful, high energy CD. It is brilliantly performed by Kiérah on fiddle along with Nova Scotia’s multi-talented Troy MacGillivray on piano and Juno award winner Andy Hillhouse on guitar. “A Fiddle Affair” features sixteen of Kiérah’s original tunes.